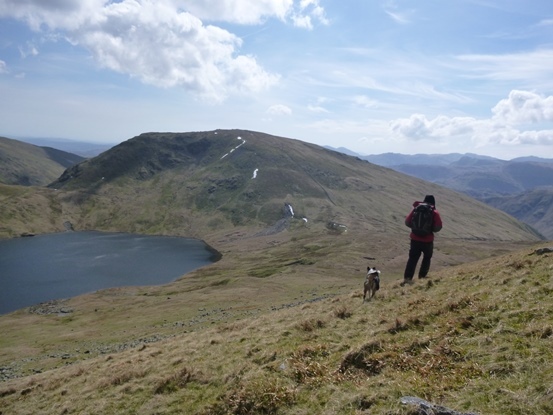 Writing this update i am reminded that every now and again in the Lakes we do get some good weather, granted May was a bit hit and miss with winter jackets still following us around, June however has kicked off in the best possible fashion! Beautiful weather on Striding edge! 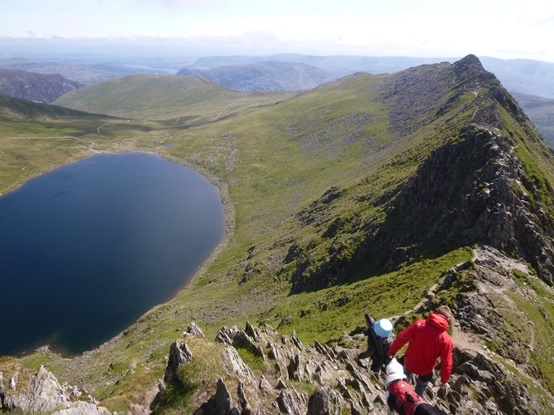 Getting back to May however…now that all the stone has been flown to our summer projects we are well and truly into the swing of our summer work programme and marching around the Fells once more. Most of our time this month has been spent up on Thresthwaite Cove because of the somewhat inclement weather at times. However we have made it up Dollywagon a few times and we even squeezed our first trip up onto Striding Edge at the very end of the month. 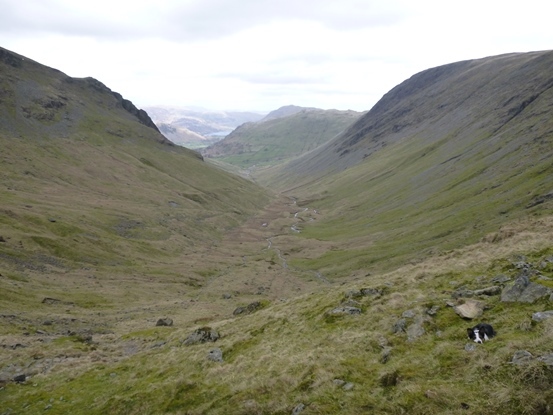 During the month we also had a work party with the Fix the Fells lengthsmen where we headed on up to the path towardsGoats Water to do some maintenance on the path. We’ll find ourselve on this route a few times this year, although it’ll be mainly much higher up and the path from Goats Hause up towards the summit of the Old Man. This is a project that has been funded by the European Outdoor Conservation Association (EOCA) whose members voted to grant us funding to complete the work. As a charity we rely on funding like this to ensure we can continue the work that we do on the fells so a massive thanks to EOCA! 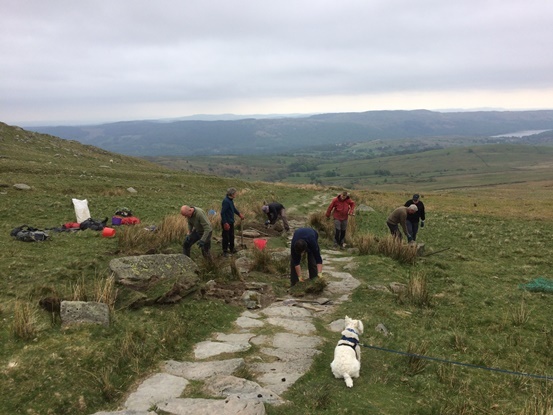 Staff and volunteers working on the path to Goats Water. We also couldnt do as much work as we do without the help of our volunteers. Alongside all the great work our longer term volunteers do, we are also lucky to have the support of many other shorter term volunteers. In particular we have a great working relationship with Kendal College, whose second year outdoor students come and spend time with us working on a specific project. It is a great relationship that has benefits for both us and the students. 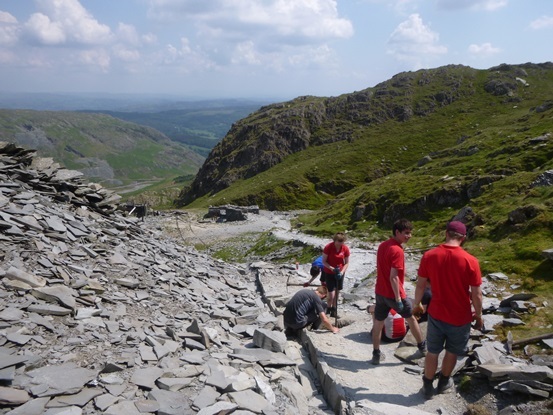 This year they’ll be helping us maintain the old pack horse route up through the mines on Coniston Old Man by putting in some more ‘end on’ pitching to match with the historical route. With the work being done in June i’m sure you’ll hear more then! Finally May is when Keswick Mountain Festival comes around and this year Sarah was asked to give a talk in the adventure tipi tent. With a tag line of ‘I hate wet knickers’ it went down well with those who came and listened, indeed Sarah even got asked to do the talk again for a local rotary club which we class as a great success! As a team we are all incredibly passionate about the work that we do and hopefully by getting out there and talking about the work that we do, alongside what it’s like to be on an Upland team we’re hoping the word will spread about our work. For now we shall continue marching around the fells and doing what we do best! Rowan doing what she does best and having a snooze! If you do see us out and about do bob over and say hi!